Allen Dulles, avuncular pipe-smoking intelligence mandarin, turns out to have been a shocking figure with admiration for major Nazis,no patience with American democracy, suspiciously peripheral to the Kennedy assassination and on and on. Devil indeed! America’s greatest untold story: the United States’ rise to world dominance under the guile of Allen Welsh Dulles, the longest-serving director of the CIA. 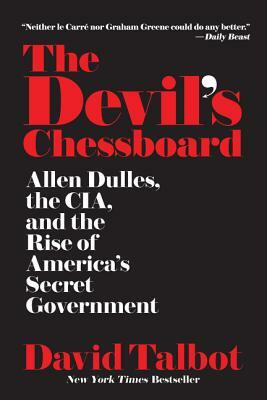 Drawing on revelatory new materials—including newly discovered U.S. government documents, U.S. and European intelligence sources, the personal correspondence and journals of Allen Dulles’s wife and mistress, and exclusive interviews with the children of prominent CIA officials—Talbot reveals the underside of one of America’s most powerful and influential figures. Dulles’s decade as the director of the CIA—which he used to further his public and private agendas—were dark times in American politics. Calling himself “the secretary of state of unfriendly countries,” Dulles saw himself as above the elected law, manipulating and subverting American presidents in the pursuit of his personal interests and those of the wealthy elite he counted as his friends and clients—colluding with Nazi-controlled cartels, German war criminals, and Mafiosi in the process. Targeting foreign leaders for assassination and overthrowing nationalist governments not in line with his political aims, Dulles employed those same tactics to further his goals at home, Talbot charges, offering shocking new evidence in the assassination of President John F. Kennedy. David Talbot is the author of the New York Times bestseller Brothers: The Hidden History of the Kennedy Years and the acclaimed national bestseller Season of the Witch: Enchantment, Terror, and Deliverance in the City of Love. He is the founder and former editor in chief of Salon, and was a senior editor at Mother Jones and the features editor at the San Francisco Examiner. He has written for The New Yorker, Rolling Stone, Time, The Guardian, and other major publications. Talbot lives in San Francisco, California.